Dell XPS M1710 laptop is a ultimate portable gaming computer that has a stunning clamshell lid, available in metallic red or black, that is illuminated with slots emitting up to 16 colors of light. Dell XPS M1710 specification are Intel Core Duo processor, 17-inch widescreen WUXGA Truelife LCD display, 512MB NVIDIA GeForce Go 7900 GTX graphics, dual-layer DVD combo drive and also all type of connectivity ports such as USB 2.0, DVI-D, VGA video output, S-Video, IEEE 1394 (Firewire), S/PDIF digital audio out, hi-def sound with integrated sub-woofer, and 5-in-1 memory card reader. NewsFactor Magazine reviewed Dell XPS M1710 laptop and rated the notebook 4.5 out of 5, and concluded that while the M1710 is definitely a high-end laptop worth considering for games and multimedia entertainment, it is way too expensive for anything but such dedicated use. Its impressive list of features will not necessarily make traditional computing tasks such as word processing and number crunching any more efficient. Overall, this is a wonderful notebook if you want to take your competitive skills on the road, but it comes attached to an exorbitant price tag. 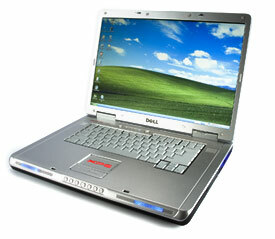 More reviews of Dell XPS M1710 available here.